There is no limit to the many ways pondscaping can be used to enhance your pond or water garden. When the right ideas are implemented pollinators such as butterflies and bees will be attracted to your pond, as well as frogs and birds. It is first necessary to decide what style you want. Are you looking for a pond that is above ground or in ground? Do you prefer your pond formal or naturalized? What types of plants or fish will be present? The decisions you make will determine the best pondscaping approach. Below are some ideas to consider. Pavers are a wonderful way to spice up your pond. They provide it with depth as well as a sophisticated appearance. The effect is amplified when the pavers are placed against a wall, particularly one made from brick. Throwing in a few plants is the perfect finishing touch. If you happen to have an old well near your home, transforming it into a pond is simply brilliant. Some of the benefits you gain from this include lower renovation costs since the well is already in place and only needs to be modified, and you’re also making effective use of space you already have. When done correctly a well pond is simply breathtaking. This is an excellent design idea for those that are looking for something formal or sophisticated. It does take considerable planning to create an oval shaped pond with flat stones surrounding it, but the pond liner’s edges will be hidden, making the end result well worth the effort. 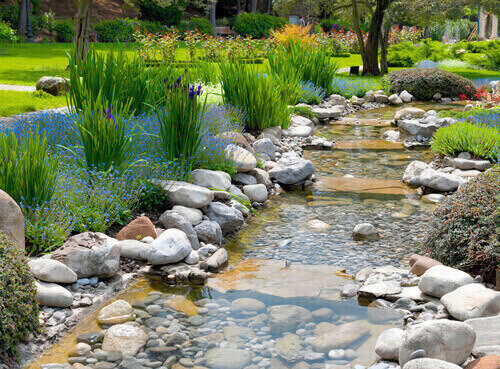 This is arguably one of the most expensive pondscaping ideas that you can undertake, but the outcome when done correctly is absolutely majestic. The best and most natural looking waterfalls are those that flow out of a hill, so keep this in mind should you choose to build one. This design idea is sometimes showcased at garden tours, and it can be highly effective in situations where you have an area which is sheltered and doesn’t receive a lot of wind. Following the right steps during construction is simple, so be sure to follow the guidelines carefully. This pond idea is elegant and works well for those that have small backyards. You will need to purchase a pump and kit for pond liners, depending on the sandiness of your soil. Sandy soil makes digging a lot easier and you can install the system within a couple of hours. You can also use branches placed across the water to prevent birds from consuming the fish. Well, these are just a few of the many pondscaping ideas that you can implement. Ultimately, you are limited only by your imagination when it comes to the many ideas you can come up with.